The Tyranids are an extremely original and unique race. 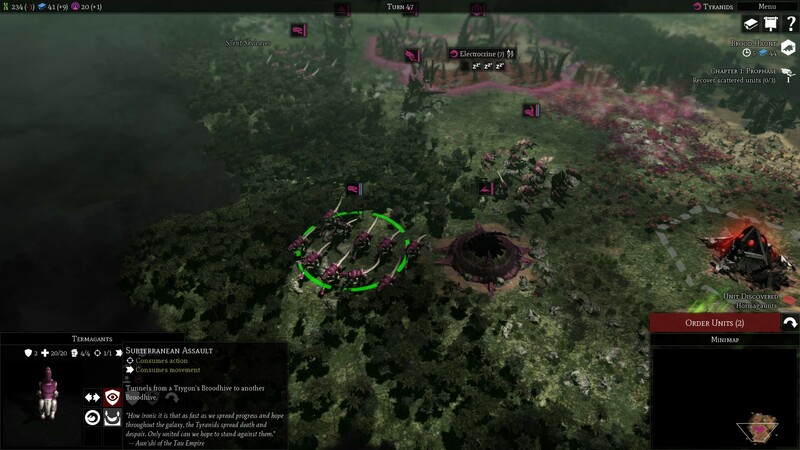 Their playstyle is rather different compared to the other factions: they field large numbers of cannon-fodder infantry which is best employed to cover for very powerful heavy infantry. They have access to highly specialised units (more on them in a units diary later this week) as well as flying monstrous creatures! They are an aggressive, expansionist race. If you play against a Tyranid AI and you find yourself bordering a ‘nids infestation, best to prepare your defenses. 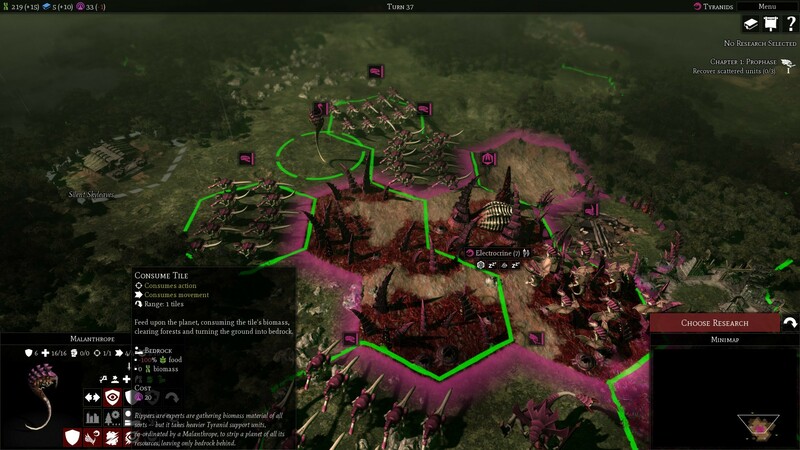 If you are playing as Tyranids, don’t refrain from going on the offensive and don’t worry about losing a few units. It’s not a faction for the faint of heart. Let’s have a look at the specifics of their gameplay mechanics. Food and ore are replaced by a single biomass resource. This is the Tyranids’ most important resource, as it’s used to build new buildings, produce and maintain units as well as sustain your population. There are several ways to increase your biomass (more on that below). Tyranids don’t make use of Energy, either. Instead, their buildings are sustained with Influence, which becomes even more important to Tyranids players. Tyranid cities are more restricted in size, but less penalized by quantity. Cities cost less, and you’re encouraged to follow a decentralized playstyle. Tyranids spread all across the world when played effectively! Production buildings can reclaim units to regain biomass and production. This is part of what makes your Biomass pool dynamic. If you don’t have a use anymore for a certain unit, get rid of it and dissolve it into the Biomass pool! Cities (when acquiring new tiles) and Malanthropes consume tile biomass and strip the ground down to bedrock. It is a one-time action which strips the terrain tile of all resources in order to add to your biomass pool. This mechanic is a strong encouragement for Tyranids players to keep expanding for new terrain to consume. Even if you are forced back, you will leave a wasteland behind you. By defeating and consuming enemies, Tyranids evolve better ways of beating them next time. Enemies defeated in the area of a Malanthrope generate research points. This bonus can be further enhanced with specific technologies. If you playing as the Tyranids you want to keep a Malanthrope where fighting is thick, to better learn from your enemies’ tactics and communication patterns. Needless to say, if you are playing against the Tyranids it will be wise to eliminate a Malanthrope if you spot one. Units outside the range of a synapse creature revert to their instinctive behaviour until contact is re-established whereas whilst in range of a synapse link Tyranid units are immune to morale effects. The Hive mind’s attention can be focused to temporarily override a unit's instinctive behaviour. Each unit type reacts differently when reverting to instinctive behaviour. This is possibly the most unique gameplay mechanic: the malus for reverting to instinctive behaviour can be very harsh. You need to keep your swarm effective by spreading synapse units evenly and intelligently. Many Tyranid monstrosities possess the ability of executing poisonous attacks. This means that certain weapons do addictional damage to enemy infantry units. Bear that in mind – when fielding a line of Guardsmen there is a high chance they will be slaughtered! Where the Tyranids arrive, the plants that constitute the Broodhive travel with them. Rapidly proliferating from seeds left by the Tyranid swarm as they pass, these plants burrow their giant hollow roots through soil, metal or stone, enabling Tyranids to pass undetected between areas. In gameplay terms, Trygons can build Broodhives across the map, and then Tyranid units can perform subterranean movements between Broodhives. This makes Tyranids potentially extremely mobile, but only if you prepare a network of Broodhives. If you are playing against the Tyranids and they manage to deploy a Broodhive next to your capital, be very afraid. These mechanics are only part of what makes the Tyranids unique and fun to play as. Everything (units, technologies, buildings, quests…) about them is completely new and different compared to what you are used to. We will describe the Tyranid units in a Dev diary later this week. Until then, we’d like to hear what you think in our forum!